Union minister Kiren Rijiju accused the CPI(M) of harbouring "anti-national" thoughts. New Delhi: Union minister Kiren Rijiju today said the kind of political violence the Left allegedly indulged in "could not be tolerated" in a democracy and accused the CPI(M) of harbouring "anti-national" thoughts. 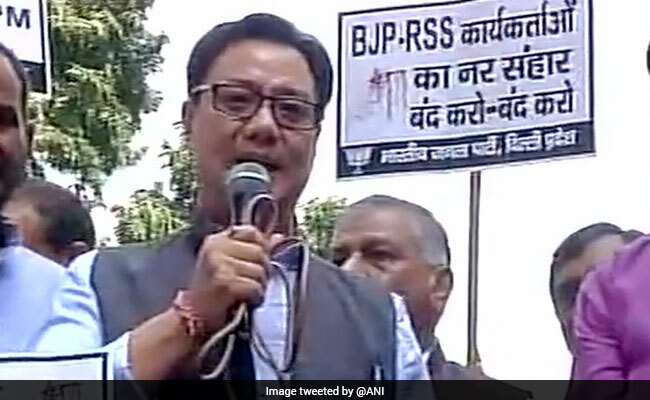 Mr Rijiju was speaking at the Delhi leg of 'Jan Raksha Yatra', an ongoing campaign to highlight the "Left's atrocities" in Kerala, which was also attended by Union minister VK Singh. In his address, Mr Singh stressed on the need to make people aware about the Left's alleged "politics of murders". "The only answer to political killings in Kerala carried out by the Left is to make people aware. The Left attempts to intimidate people through such killings but we do not fear such tactics," Mr Singh alleged. Mr Rijiju claimed had the Congress been at the Centre, President's rule would have been imposed in Kerala, but the BJP was fighting the Left through "democratic means". Scores of workers from the CPI(M) and the BJP/RSS have been killed in the coastal state in the recent years due to an intense turf war between the two sides and the fight has only escalated with a saffron overdrive to make inroads into traditional Left bastions. "This is time for action. We will not let forces against our country to survive for long. The CPI(M) has anti-national thoughts. We are BJP workers and have survived difficult conditions," he said. Later, speaking on the sidelines, he said in a democracy like India, violence cannot be tolerated and that the communists would not have their way anymore. After the leaders spoke, hundreds of BJP workers carried out a 'shav yatra' (symbolic funeral procession) from Central Delhi's Mahadev Road to the CPI(M) office at Bhai Vir Singh Marg. Police dispersed the protesters using water cannon. Launching the Delhi leg of the campaign yesterday, BJP chief Amit Shah had alleged that the "politics of violence" was in the nature of communists and asserted that no amount of intimidation could stop the BJP's rise in the state. Mr Shah had started the 'Jan Raksha Yatra' from Kerala's Kannur district on October 3 as part of the BJP's efforts to expand its base in the Left citadel. The campaign would conclude on October 17 in Thiruvananthapuram and would likely be attended by a number of senior BJP leaders.